We're a platform for Liberian storytellers using text, audio and visual media. 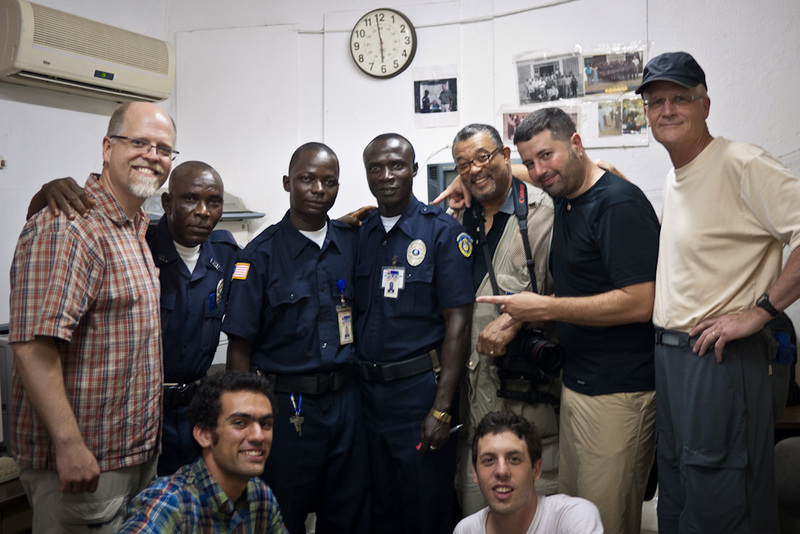 David Trotman-Wilkins, (center/back row), still can smile after being forced by Liberian police to erase two photographs he took of the new U.S. Embassy in Monrovia. Over my career, soldiers and police have confiscated my film and digital images in Cuba, Honduras, Armenia, Malawi and Uganda. But this last time when we arrived here, it was David Trotman-Wilkins who inadvertently broke the law. His transgression? Taking two photos of the currently under construction U.S. Embassy. Here’s what happened: Our group rented two taxis and asked for a tour of Monrovia. Riding in the second taxi, David was taking pictures as we drove around town. As we passed an enormous construction site that is fast becoming the new U.S. Embassy, he shot two photos. A Liberian police officer saw him and tried to stop the taxi, but the driver, fearing he would lose his license, drove on. Like something out of a James Bond movie, the officer stopped a passing motorcyclist, hopped on the back and began chasing David’s taxi. Weaving through the congested streets in front of that taxi, we in the first car had no idea the officer was chasing our caravan. As our car crawled into an intersection, the officer caught up, and, in the middle of the intersection, jumped off the motorcycle and stopped David’s taxi. He and the driver argued as a crowd formed, adding tension. After five minutes, the officer directed them to follow him to the current U.S. Embassy. Our taxi followed. Outside the embassy, David was led 30 yards from where the rest of us gathered. The police questioned him for a few minutes, then told David to follow them inside an unmarked building. David refused. Too many people have disappeared that way, he later told us. David waved us over, figuring he was safer in a group. So we followed the officer and his superior as a group into the unmarked building. The supervising officer told David to erase the images from his digital camera. He watched David closely, then asked him to prove the images were gone. Satisfied, the officer smiled. Mission accomplished. I wanted to mark the occasion. Figuring the tension had passed, I smiled and asked if we could take a photo with our new friends. After some coaxing, the officers agreed. But they insisted it be inside, not wanting to shoot photos with the embassy in the background. We shook hands, shot pictures and said goodbye. No one photographed the embassy on the way back to our guest house. While I understand the importance of security, I did find the situation ironic. It’s strange to be here teaching Liberians the importance of a free press and winding up in trouble for taking pictures of a symbol of my own country’s freedom.